What is a Bear Market? The U.S. Market (S&P 500) is down about 20% from its high in September 2018. The government has a partial shutdown, there is trade uncertainty, the Fed increased interest rates, there is a tight labor market, and slowing earnings growth. With all of this negative news and a dropping market, it’s easy to get panicked and make poor investment decisions. I want to review what to do during these down market times. In general, a downturn of 20% or more from a peak in a broad market index, such as the Dow Jones Industrial Average (DJIA) or Standard & Poor’s 500 Index (S&P 500), over a two-month period is considered a bear market. A stock bear market is different from a market correction. Generally, a market correction is a drop from 10% to 20% off the highs. Obviously, market corrections are far more common than bear markets. Market losses are part of the reality of investing in stocks. If you plan and prepare, they can be not only tolerable but profitable. The markets move up and down but somehow the losses seem more painful. When markets move up, an investor now has that new increased amount of money in investments, it’s hard to go down from that peak amount and adjust to losses. Sometimes people get nervous when markets drop and fear that this down-turn is different and may not stop. The best advice I can give investors is to stay calm. Markets are volatile and will rise and fall dramatically with unexpected events, such as: legislative actions, protests, military actions, world events, natural disasters, economic forecasts, …. The chart below shows the bull and bear markets during a 103 year period. Bear markets and market corrections are temporary. It’s important you put them into perspective. From 1903 to 2016, there have been 25 bear markets and market corrections. Some far worse than others, but 25 of them have occurred over that 89 year period. Historically, about 1 in every 4 years we experience significant stock market losses. We have not had a bear market since Great Recession, about 10 years ago. Hence, we are due for another. Source: CFRA and S&P Dow Jones Indices. The average bull market lasts 31 months. The average bear market lasts 11 months. That’s nearly a year of adjusting to losses in your stock portfolio. As long as you stay calm and don’t lock in those losses by selling in down markets, you will be alright. The year after a bear market is generally a boom market. In the year after the three previous 20%+ market losses, the index gained an average of +32%. You have stay invested during the down times to get the benefits of the recovery. Much of the upturn happens before the economy seems like it has recovered. Stock markets are forward-looking, anticipating future conditions. The stock market may already have priced in the effect of a recovery before the recovery actually occurs. One of the problems with trying to sell when you think the market is high, is not knowing when to get in again. Almost all big stock market gains and drops are concentrated in just a few trading days each year. Missing only a few days can have a dramatic impact on returns. An investor who remained invested in the S&P 500 Index throughout the 20-year period from 1994 to 2013 (5,037 trading days) would have earned a sizable 9.22% annualized return, growing a $10,000 investment to $58,352. When the five best-performing days in that time period were missed, the annualized return shrank to 7.00%, with $10,000 growing to $38,710, and if an investor missed the 20 days with the largest gains, the returns were cut down to just 3.02%. If the 40 best-performing days were missed, an investment in the S&P 500 turned negative, with $10,000 eroding in value to just $8,149, a loss of $1,851. Generally, bear markets are about a third as long as a bull market. We are in bear markets much less of the time than bull market. Not only do bull markets last longer, the positive movement during bull markets is more than the downward movements during bear markets. The chart below illustrates the volatility seen in the market every year. The blue bars show the annual US stock market return for the last 37 years. 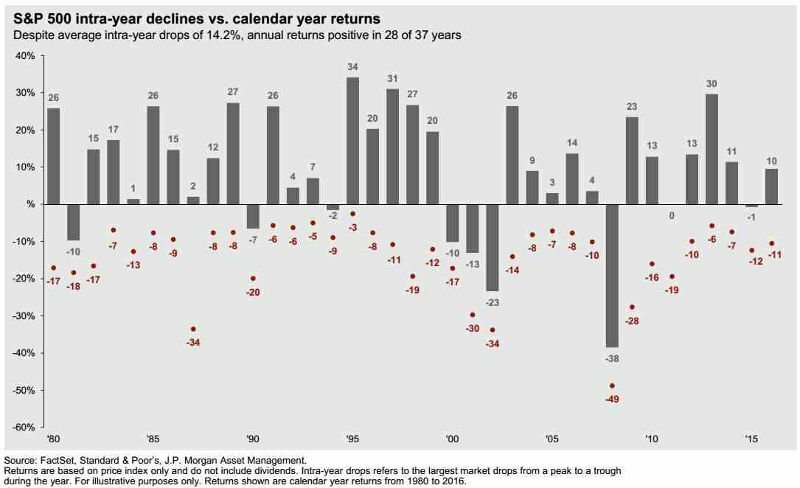 The red dots are the lowest loss point for each year. This shows that every year there are losses in the market, some years are worse than others. If you average out all of the red dot intra-year stock market losses, it’s about 14%. That means that each year, on average, the stock market will drop 14%. Whether it rises then falls, or starts off poorly and recovers, the market will significantly drop every year. Be cautions judging your individual investments too harshly on short term returns. The markets will make significant moves each year and the cable news shows will fill hours of air time pretending to know why it happened and predicting what will happen next. These shows need to keep an audience to sell advertising so they make predictions that are usually no better than a coin toss. Notice how little time is devoted to fairly evaluating their prediction records. The markets are priced at what is thought to be a fair value given the information available. Unanticipated events cause the largest fluctuations. They would not sell any ads if they said, stay calm, market corrections are normal, they happen each year. Have a full financial plan in place so that you will keep the impacts on you in perspective and know how it fits into your larger plan. Have a prudent reserve to cover your needs if the market is down. The worst time to sell is when the market is down. If you are concerned about a bear market, be sure to have enough stable assets available so you do not need to sell during a bear market – which is typically 11 months. Rebalance your portfolio regularly. This forces you to buy when assets are low and sell when assets are high. It improves performance and keeps you from getting unbalanced and over-exposed in any one asset class. Down markets are good investment oportunities. Be optimistic – when markets are the worst, the best investment opportunities exist. When markets are doing poorly, there are generally great investment opportunities. Think through different scenarios to be sure you have a solid plan. 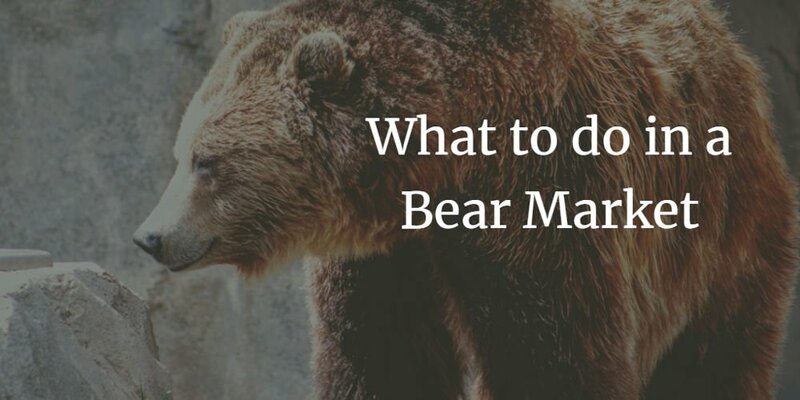 What if a bear market lasts for 11 months or more – will you need to sell stock? Equity (stock) investing is just one part investing which is just one part of a complete financial plan. It may be the most interesting to discuss with friends but it’s only a small piece. Your overall portfolio is built of many other asset classes and your financial plan also includes: tax planning, spending/retirement planning, insurance, and estate planning. One big reason investors underperform the market is that they don’t have a plan in place. Without a long-term plan, it’s easy to make decisions based on fear and pure emotions. Plan so that you can avoid this trap. Since World War II, the S&P 500, on average, has incurred declines of 5% or more every six months. 85% of all S&P 500 declines of 5% or more got back to breakeven in an average of four months or fewer. Hence, investors should be thinking about buying during this downturn rather that thinking of selling. Learn about making an impact with your investments without sacrificing returns. Learn about many different types of investments that can provide diversification and better overall portfolio returns. Copyright © 2019 AIO Financial. All Rights Reserved.